Looking to protect your vehicles and other valuable equipment, such as boats, from changing weather conditions? Consider the selection of metal carports for sale at Alan’s Factory Outlet. When you buy from us, you can choose the size of your metal-roof carport and its style. Cover your valuable items the easy way with durable, cheap metal carports from Alan’s Factory Outlet! Our simple online ordering process and factory-direct prices save you time and money. Is a Carport Considered a Garage? No, a carport and garage are two different things, though they both serve as a storage structure. Carports are generally not enclosed structures, whereas garages have four walls. A carport serves mostly as a cover to protect against sun and precipitation. How Much Do Metal Carports Cost? Our high-quality but cheap carports range from $1,095 to $4,195. Our carports don’t sacrifice quality, but our great prices can help you stick to your budget. What Sets Our Metal Carports Apart? Many options, including gables and enclosed sides. Whether you want a carport shelter that’s fully enclosed or a partially enclosed metal carport, we can create it for you. How Tall Is the Average Carport? The metal carports start out at 6' tall, but each car shelter is available in many different heights. Select a carport or garage and you can also choose the color of its roof and trim. Our portable carport kits are all built on site, and triple-wide carports, metal barn lean-to buildings, and 40-foot-wide carports are also available. Our steel carports have a 29-gauge metal sheeting roof. The tubing on them comes standard at 14-gauge, but 12-gauge tubing is an option for all of our carports. If you’re wondering, “Where can I get free installation of metal carports near me?” you need look no further. The steel carports for sale in our inventory can be delivered and set up for free in more than two dozen places, including Alabama, Arkansas, Colorado, the District of Columbia, Florida, Georgia, Illinois, Indiana, Kansas, Kentucky, Louisiana, Maryland, Mississippi, Missouri, New Jersey, New Mexico, New York, North Carolina, Ohio, Oklahoma, Pennsylvania, South Carolina, Tennessee, Texas, Virginia, and West Virginia. The width of the carport is one of the first things to figure out. Not sure what size metal carport you need, feel free to use the carport size selector tool to get a starting point for how wide of a carport you may want to consider? Please keep in mind it is always a good idea to measure your car, truck or rv to make sure you are comfortable with the size of the carport you are thinking about buying. What size carport do I need? Let's see our recommendation. Please select option. The carports for sale at Alan’s Factory Outlet are made of steel or aluminum. There are many benefits of owning one of our steel or aluminum carports. The steel carports for sale here can protect your farm equipment, truck, RV, and other vehicles from the snow, hail, rain, wind, and blazing sun. Rain and snow can cause your vehicle to develop rust, resulting in costly repairs, and rubber tires can become worn when a vehicle is parked outside without protection. Keeping your vehicle under one of our portable metal carports can help to keep it in good condition. A metal-roof canopy is ideal for sheltering bicycles, cars, motorcycles, and equipment from the inclement weather. All of our carports serve as solid shelter for your property. Another benefit of owning one of our metal car shelters is easy access. 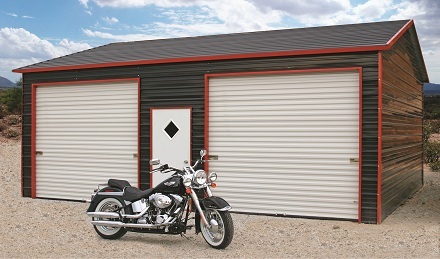 Our metal carport kits are an ideal alternative if you don’t want the hassle of locking and unlocking your storage space. There’s no garage door to open and shut or door keys to keep track of. The open, airy environment of our carports makes them a favorite with many of our customers. Does the Price of a Metal Carport Include Setup, or Do I Have to Assemble the Carport Myself? We’ll deliver and set up your metal carport on level land in Alabama, Arkansas, the District of Columbia, Florida, Georgia, Illinois, Indiana, Kansas, Kentucky, Louisiana, Maryland, Mississippi, Missouri, New Jersey, New York, North Carolina, Ohio, Oklahoma, Pennsylvania, South Carolina, Tennessee, Texas, Virginia, and West Virginia. What if I Want to Pick Up One of Your Metal Carports for Sale Near Me and Install it Myself? We do not allow steel carports to be picked up. However, you can have your carport dropped off at your home. Customers who prefer to assemble their own carport kit appreciate this option. Though we give you this choice, we don’t recommend it. If you choose to assemble it yourself, you can save 5% on your purchase, but keep in mind that your carport or metal building won’t be covered by our one-year workmanship warranty. After I Order My Metal Carport, How Long Does it Take for My Delivery to Arrive? While our estimated delivery time frames are not guaranteed, about 90% of the time, delivery occurs within 60 days of receiving your order at the factory. Please keep in mind that if you live in an area that receives any kind of winter weather, there is an increased chance of exceeding the 90-day estimate. Winter weather conditions can make it difficult to complete an installation. If it takes more than 90 days to deliver your carport or metal garage, we will offer you a 10% discount off the balance due once it’s installed or, should you wish to cancel, provide a full refund of your deposit. However, this guarantee does not apply from October to spring for deliveries and installations in northern areas, as winter storms are likely to cause delays. Our installers have to wait for two to three days of workable weather in the area before the delivery can be scheduled. If the delivery date does not work for you, then the time frame starts over again and your delivery will have to be put on the next load. The scheduler for your state will call to schedule the delivery approximately one week prior to the delivery date. How Long Will it Take for My Metal Carport to Be Installed? Most small metal carports can be installed in a few hours. Larger carports or partially enclosed carports may take half a day or the better part of a day to be installed. Do I Need a Permit for Metal Carports? It’s possible that you will. The answer depends on your local zoning laws. Check your municipality’s website for more information about zoning laws that may apply to you. What Is a Boxed Eave on a Carport? A boxed eave is a style of roof built on an A-frame structure that has horizontal roof panels but no ridge cap. 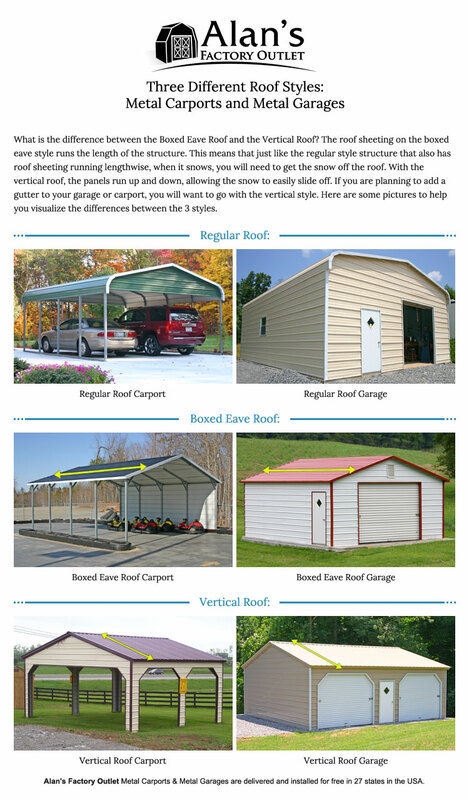 What Is the Difference Between Regular, Boxed-Eave, and Vertical-Style Carports? The regular-style carports are rounded on the sides and have a barn-shaped roof. This is the most economical roof style for metal carports. The leg height is officially 6 feet, but at the top of the bend on the leg, there is an additional foot. This brings the total length of each leg to 7 feet. A boxed-eave carport has an A-frame gable roof with a 6-inch overhang on both sides. A vertical carport has an A-frame roof as well as a 6-inch overhang on both sides. All carports have a 6-inch overhang on the front and back ends. What makes the vertical carports different from the boxed-eave carports is a design feature of the roof. On the vertical-style carport, the roof sheeting runs up and down the length of the roof, allowing the snow to easily slide off the side so you won’t have to rake the roof! In order to attach the sheeting to the vertical carport, bracing is put under the roof. The vertical carport is the only model with this roof design. On the other two styles, the metal roof runs horizontally along the length of the building. Can the Carports Be Made Taller? Yes. The steel carports can be made taller in 1-foot increments with legs up to 16 feet tall. Are the Carports Available With Wider and Longer Dimensions? Yes. There are a wide variety of sizes available. We have carports that are 12 feet, 18 feet, 20 feet, 22 feet, and 24 feet wide. The triple-wide carports are built 26 feet, 28 feet, and 30 feet wide. We also have our 40-foot-wide carports, which come in 32 feet, 34 feet, 36 feet, 38 feet, and 40 feet wide. The lean-to carports come in 36 feet, 42 feet, 44 feet, 46 feet, and 48 feet wide. Our lean-to carports have a 12-foot lean-to on both sides. The lengths of our carports start out at 21 feet and increase in length in 5-foot increments. The lengths are 26 feet, 31 feet, 36 feet, 41 feet, 46 feet, 51 feet, 56 feet, 61 feet, 66 feet, 71 feet, 76 feet, 81 feet, 86 feet, 91 feet, 96 feet, and 101 feet. To make the carports longer than 41 feet, we attach two carports end to end. Our carports can be built longer than 101 feet, too. We recommend the vertical roof style for any carport measuring 41 feet or longer. Can Carports Be Made in a Custom Width or Length? Yes, we can customize the size of each portable carport. To do so, we’ll charge you the price of the next largest standard-size carport. As an example, let’s say you need a carport that is 17 feet wide. The standard widths are either 12 feet wide or 18 feet wide, so we’ll charge you for an 18-foot-wide carport. This same rule applies to the length. If you need the length to be 24 feet and the 26-foot-long model is too long, we can make the base 24 feet long but we’ll charge you the price of a 26-foot-long carport. When figuring out the size of your carport, you should consider that when we say 26 feet long, that includes a 6-inch overhang on the front and back ends, making the exact base 25 feet in length. All of the widths of carports are the exact base rail dimensions. The length listed includes a 6-inch overhang on the front and back ends. So if you order a 24-by-26 carport, you will want the concrete slab to be exactly 24 feet wide by 25 feet long. What Is the Carport Warranty? There is a one-year workmanship warranty from the date of installation. In addition, the framing on the optional 12-gauge thicker tubing receives a 20-year rust-through warranty. How Many Different Color Options Are There? For the roof color and trim, there are 16 different color options. Also, check out our steel carport color chart: Red, sandstone, blue, and green are just a few of the appealing colors available to customers who order a steel carport. How Do I Order My Carport? You can place your carport order online, or we can write up your order over the phone. To find a price, you can use the metal carport quote form located on our contact page or call us at 1-888-537-2296. We accept personal checks, Visa, Discover, MasterCard, and American Express for all of our carports, metal garages, and other structures. How Much Do I Need to Put Down When Ordering a Carport? The deposit is 10% to 17% depending on the size of the carport. The remaining balance is due after the carport is installed. What Is a Carport That’s Certified? Certified metal carports are a smart choice if you live in an area that requires delivery of blueprint drawings to the local building department, which is included with purchase. These structures are rated for up to 130 mph wind and a 30 psf snow load. The certified package is available at an additional cost depending on the size of the carport. Certified carports also include mobile home anchors if they’re to be anchored to the ground.